What will you cook for the cold season? 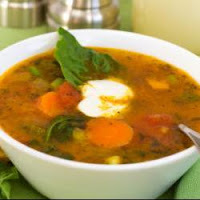 Hot, healthy, delicious soup sounds satisfy your tastes and appetite. What for you eat canned stuff when you can dish out real soup made with heart healthy olive oil and fiber from the onions and vegetables? It’s only takes a few minutes to prepare and is perfect for busy days when you need real food but don’t have a lot of time. Add garlic and ground meat. If using whole garlic, mash the clove before adding to mixture. Continue to sauté until meat is done. Add beef broth and canned tomatoes. Rinse and drain kidney beans, drain corn, and add chili seasoning to mixture. Cook at a low simmer until beans and corn are heated through. Add cabbage and cook just until cabbage is wilted. Serve immediately for 6 to 8 persons. Serve with a dollop of sour cream and shredded cheddar cheese sprinkled over the soup if desired. Add corn muffins or corn bread or hot rolls to taste. If You a vegetarian, you can prepare without ground meat and with vegetable broth instead of the beef broth. This recipe provide protein, as well as fiber, because of the bean and corn combination. Do You Like Instant Coffee? Yummy or Yukz?? How Much Protein Do Foods Contain? How To Select And Store Instant Coffee? More Fruits, More Vegetables: No More Cancer! This Is How You Load Up On Lean Protein! How Caffeine Can Bring Big Impact For My Body?